NUI Galway’s Rory Monaghan outlines the role of Smart Hydrogen as a pathway to energy system integration for low-carbon, energy-secure communities. One of the key challenges faced by Europe and Ireland is how to meet stringent sectoral renewables targets, decarbonise our economy and increase energy security. Given the abundance of wind energy in Ireland, the technical constraints imposed by our electricity grid and our failure to date to decarbonise transportation, greater energy system integration presents an enormous opportunity for Ireland. This lack of grid capacity is the biggest limiting factor in increasing the utility and community scale renewable energy supply throughout the island of Ireland. Rural and isolated communities face unique energy issues related to efficiency, reliability and sustainability. This is commonly due to dependency on external and fossil fuel energy supply, low electricity grid capacity and limited or no connection to wider grids. As a result, these communities are dependent on heavily polluting fuels, have higher than average carbon emissions and are more vulnerable to fluctuating fuel prices. This situation accentuates Ireland’s failures to arrest the rise in national greenhouse gas emissions, and to offset fossil fuel use in the heating and transportation sectors. Renewable energy sources continue to increase their share of installed capacity worldwide. Their integration, in conjunction with increased energy efficiency and other low-carbon technologies, constitutes the best opportunity to achieve energy sustainability. They also constitute the best option to avert the risks that conventional non-renewable sources pose to health, geopolitics, the economy and the environment. In accordance with their commitment to 2020 targets, EU member states have created national renewable energy action plans (NREAPs). Each NREAP aims to develop mixed energy systems that rely on a variety of renewable energy sources and energy carriers. These plans involve reducing greenhouse gas emissions and increasing renewable energy penetration targets for the electricity, heating/cooling and transport sectors. These three sectors account for 20 per cent, 40 per cent and 40 per cent, respectively, of total end-use energy demand. To shift from a hydrocarbon-based economy to a renewable one, there is a need for clean sustainable energy carriers. Energy carriers have now been identified as the key enabling solution that allow renewable electricity sources, like wind and solar, to supply different forms of energy demand across these sectors, and thus strengthen their technical and economic viability. Hydrogen is one of these carriers that has attracted significant support around the world. In fact, it has the potential to become one of the main energy carriers of the future as it can be easily produced using renewable electricity, stored using commercially available technologies and used throughout the entire energy system in, for example, in fuel cell vehicles and/or the natural gas grid. The use of hydrogen as an energy carrier however, has been hindered by specific challenges that need to be addressed, including current low demand and relatively high production costs. Smart Hydrogen enabling low-carbon energy security for commission. The Interreg North West Europe funded project GenComm, which includes industrial and academic partners from across the island of Ireland, is seeking to address the barriers preventing the greater integration of renewables into our energy matrix and to navigate a new pathway to low-carbon energy security. GenComm (GENerating energy secure COMMunities) is designed to develop a new model for exploiting generated electricity from renewable sources to provide energy security for remote communities. Every community in Europe consumes energy for power, heating and transportation. 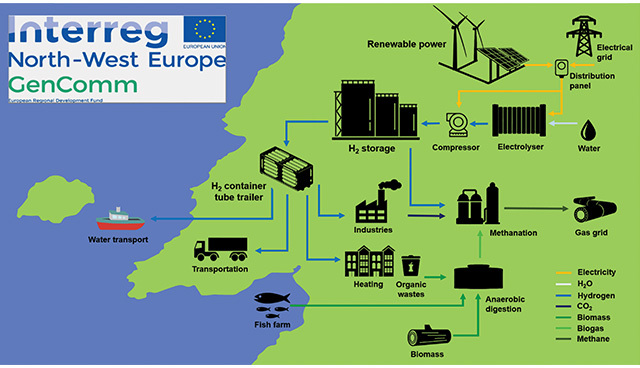 The GenComm project will commission three ‘Smart Hydrogen’ pilot plants across north-west Europe, each producing hydrogen from a different renewable source – anaerobic digestion, solar and wind. The pilot sites will demonstrate how hydrogen operates as an energy carrier in the power and transportation sectors. This will help overcome the current obstacles blocking greater utilisation of renewable energy in our energy consumption matrix. 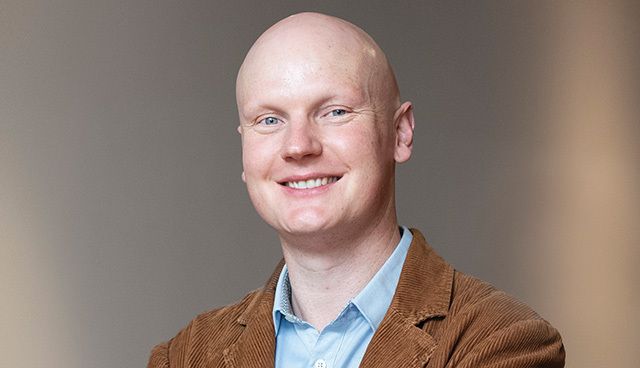 Work at GenComm partner NUI Galway, led by Ryan Institute Principal Investigator Rory Monaghan, will develop a Smart Hydrogen investment decision support tool, called Smart H2GO. This will enable communities, wind and solar farm developers and operators, utility companies, policymakers and others to assess the economic opportunities of community-scale energy storage through hydrogen production and use. The team at NUI Galway, in collaboration with James Carton at Dublin City University, will also lead the creation of the Irish Hydrogen Association and the Community Hydrogen Forum. These networks will be launched in the coming months for key stakeholders in the hydrogen and related sectors. Any organisation interested in learning about them or joining are encouraged to contact Rory Monaghan at rory.monaghan@nuigalway.ie.